Are you Looking for the Perfect Assessments? I use the assessments below in my classroom. I have used and perfected these assessments for over 15 years, and I truly believe them to be the perfect kindergarten and Pre-K assessment packets. And yes, they are strategically linked to Core Standards. A few years ago I found ESGI and it completely transformed the administration and data collection of these assessments. Before ESGI, I ran a copy of the assessments for each student, had an organized assessment binder for both math and reading, and then spent hours transferring the data to a spreadsheet that automatically color-coded the students to red, yellow and green. This took me HOURS of time! But ESGI has changed all of that, it is literally Click Click Done! Now, I test my students on the iPad or my computer using my tried and true authentic assessments, have immediate data results and all of the tools necessary to utilize this data to improve student learning. I can even access built-in RTI and SLO data at the touch of a button. 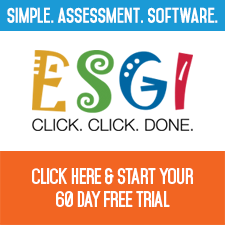 I have partnered with ESGI and my perfect assessments are available both traditional paper or with ESGI, digitally with no extra cost to you. If you want to try ESGI using a free 60 day trial. Remember to enter the promo code B7227. You will find all of the paper assessments below already loaded on ESGI. All of these assessments are also available on TPT.